In seventh grade I tried out for the cheerleading squad. It's what girls did, especially those who wanted to be popular. Girls rooted for the boys who played the games. On NFL sidelines and near midline of basketball arenas, scantily clad women still do. Perhaps this is why I like baseball best. By eighth grade, I left cheerleading behind, forever, and was playing on the girls' basketball team. No one showed up to watch our games except an occasional mom. Mine arrived with younger siblings who could never sit still and sometimes ran onto the court, so my mom had to leave. We didn't have cheerleaders jumping up to spell A-M-H-E-R-S-T when our team took a time out. The cheerleaders only cheered for the boys. — Melissa Ludtke, forthcoming "Locker Room Talk"
Once I was on the basketball team, I never was a cheerleader again. From then on, I always played on one team or another – volleyball in the fall, basketball in the winter, tennis in the spring. In the summer I skippered our family's cat boat as the only girl at the helm in races against the guys. In college I discovered rowing – it's my passion, still – and became an inaugural member of Wellesley College's intercollegiate rowing team – in the same year Title IX was birthed. 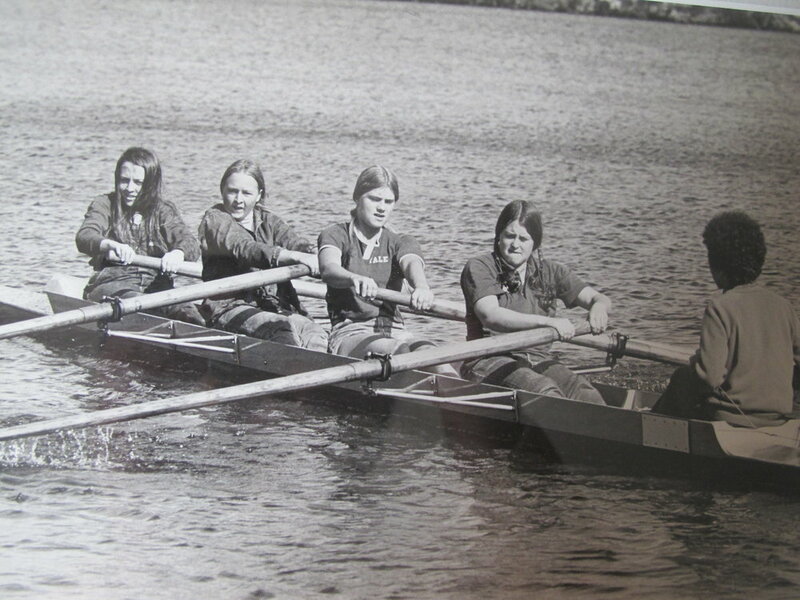 Wellesley intercollegiate crew team, 1972. Author, second from left. With my own girlhood sports experiences, I was lucky. It was the 1960s and America was a decade away from Title IX opening opportunities for girls. As I found out later, back then few girls my age had sports teams they could play on. In my hometown of Amherst, MA, we did. On the basketball court, we were the Lady Hurricanes. We won a few games each season, lost a few others. A scorekeeper tracked the points we scored and our fouls. Not many spectators came. I don't have a single photograph of me playing in a game, expect one in a yearbook I can no longer find. Nor can I go back to our school newspaper to find stories about our games. No one wrote about the Lady Hurricanes. By then it was the mid-1990s and after just about being state champions for several years in a row, the Lady Hurricanes finally did win the state final in 1993. That season Pulitzer Prize winning journalist Maddy Blais, a journalism professor at the nearby University of Massachusetts, followed the Lady Hurricanes as they finally triumphed after the succession of soul-crusting defeats. Maddy knew these girls' story was worth telling. She titled her book: "In These Girls, Hope Is a Muscle," and I commend her book as a terrific read. When she set out to write this story, it didn't matter to Maddy that the Lady Hurricanes played in gyms sparsely filled with spectators – until a championship seemed within their reach. She came to tell a story about athletes founding within themselves what it takes to overcome self-doubt, push through adversity, mend differences, and bond as a team to achieve their shared goal. Theirs is a universal story, though one too often reserved as a narrative fit for male heroes, especially when it comes to sports. Yet this story echoes today as Americans celebrate the U.S. women's hockey team's gold medal. Four years ago some of these same women hockey players lost In a heartbreaking overtime game to Canada. While battling powers that be in their sport for the gender equity in pay, treatment and respect they felt they deserved, these women dug deep within themselves and built this team's mental fortitude so they'd not be defeated again. In my next blog post I'll write about Dave Kindred, a sportswriter who covered every major sports event that a man of his generation could attend and received awards recognizing his excellence. Now in a small town in Illinois, Dave attends every game the Morton High School Lady Potters basketball team play and writes a story about each one.